Democrats have invested big in turning out young voters in 2018 in the hopes that they could help swing some key races. After all, young voters largely lean Democratic. And as my colleague Geoffrey Skelley wrote this week, there is some evidence that young voters might turn out in larger numbers this year than they typically do. But saying that youth turnout might increase is not the same as saying it’ll be high. All indications are that turnout among young voters will still significantly lag other age groups this year. Another measure of voter engagement is voter knowledge. Pew found that voters ages 18 to 29 aren’t scoring very high: Six in 10 said they knew either “not too much” or “nothing at all” about the candidates running for Congress in their district. Older voters seem to be better informed — 76 percent of those ages 65 and older said they knew a “great deal” or a “fair amount” about the congressional candidate in their district. Other recent surveys we looked at provided little indication that young voters are fired up to vote. An Oct. 1 Marist College poll asked voters how important they think the midterm elections are and found that young voters (18-to-29) were less likely than older age groups to say it was “very important.” And in a poll conducted this week, YouGov asked voters whether they were more or less enthusiastic to vote this year, compared with previous midterm elections, and found that 18- to 29-year-olds were more likely than any other age group to say they are less enthusiastic. Of course, it’s possible that turnout rates among young voters this year could still surpass those in previous midterm elections, but so far, young voters don’t seem close to the engagement level expressed by other age groups. The FiveThirtyEight governors forecasts are officially out! According to the “Classic” version of our model, as of Thursday afternoon, three gubernatorial races are toss-ups: Georgia, Ohio and Nevada. Democrats, on average, are forecasted to govern 194 million people in roughly 23.7 states. Republicans, on average, are forecasted to govern 135 million people in 26.3 states. In the Florida gubernatorial race, Democrat Andrew Gillum and Republican Ron DeSantis are essentially tied, according to a survey by St. Pete Polls. In the state’s Senate race, Republican Rick Scott and Democrat Bill Nelson, the incumbent, are also in a dead heat, the poll found. An Emerson College poll of Nevada’s Senate race found the Republican incumbent, Dean Heller, with a 7-percentage-point lead over the Democratic candidate, Jacky Rosen. A Siena College/New York Times poll found Heller up by only 2 percentage points, however. As of Thursday afternoon, FiveThirtyEight’s Classic forecast classifies the race as a toss-up. In Pennsylvania’s 1st Congressional District, a Siena College/New York Times poll found Democrat Scott Wallace leading Republican Brian Fitzpatrick 50 percent to 43 percent. As of Thursday afternoon, FiveThirtyEight’s Classic forecast classifies the race as a toss-up. A Siena College/New York Times poll in Minnesota’s 8th District found Republican Pete Stauber with a 15-percentage-point lead over Democrat Joe Radinovich. A poll of Michigan’s 6th District that was released by the Democratic Congressional Campaign Committee found Republican incumbent Fred Upton 3 points ahead of his Democratic challenger, Matt Longjohn. All the polls that FiveThirtyEight has collected in this race, including the DCCC one, are from partisan Democratic pollsters, so Longjohn’s chances may be overstated. 56 percent of registered voters told Morning Consult in a recent poll that President Trump represents the majority viewpoint of Republicans in Washington, D.C. That’s up 13 percentage points since April and 23 points since August 2017. A YouGov poll found that among those who said they were interested in Major League Baseball, 32 percent said they thought the Houston Astros would win the World Series. Thirty percent thought the Boston Red Sox would win, 23 percent thought the Los Angeles Dodgers would win, and 14 percent picked the Milwaukee Brewers. A poll of rural Americans conducted for NPR, the Robert Wood Johnson Foundation and Harvard’s public health school found that 25 percent of rural Americans said drug addiction or abuse was the biggest problem facing their communities. Economic concerns, such as poverty and the availability of jobs, was the second-most-cited concern, at 21 percent. About 4 in 10 said their lives have turned out better than expected, and 54 percent said they are better off financially than their parents were at their age. Pew Research Center asked voters about what they see as “very big” problems in the U.S. today. Out of a list of 18 issues and topics, Pew found the biggest partisan divides on climate change and the way minorities are treated by the justice system. Seventy-two percent of people who support the Democratic candidate in their congressional district said climate change was a “very big” problem, compared with 11 percent of people who support the Republican candidate. The gap dividing Democrats and Republicans was also 61 percentage points on the criminal justice issue. Voters in Georgia (the country, not the state) will go to the polls on Oct. 28 to elect a new president. A poll by Edison Research found that Salome Zurabishvili — an independent candidate backed by Georgian Dream, the current ruling party — had support from 15 percent of respondents but trailed Grigol Vashadze — who is a member of an alliance of opposition parties called Power is in Unity and had support among 22 percent of respondents. Zurabishvili also trailed David Bakradze, who is the leader of the European Georgia party and received 18 percent in the poll. The poll shows that among the 25 candidates who will appear on the ballot, none is likely to get 50 percent of the vote. This means there will likely be a runoff between the top two candidates. President Trump’s approval rating is 42.6 percent, according to our tracker. His disapproval rating is 52.2 percent. 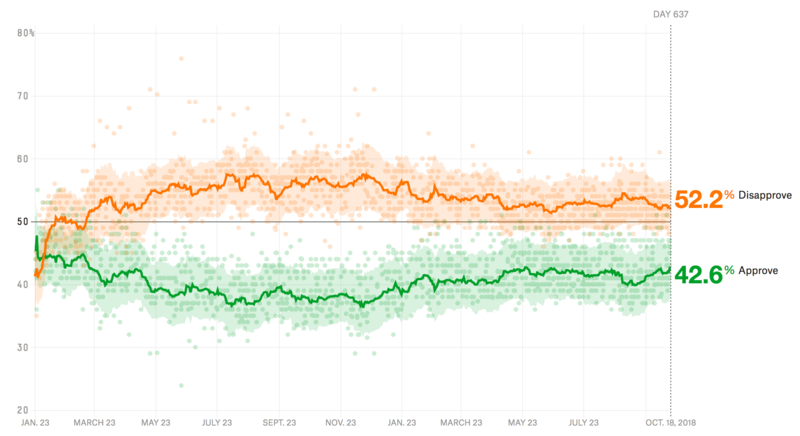 That makes for a net approval rating of -9.6 points — slightly better than his net approval rating from a week ago (41.8 percent approval and 52.5 percent disapproval). Trump’s net approval rating has improved by about 4 points from a month ago, when 40.4 percent approved of his job performance and 53.8 percent disapproved of it. 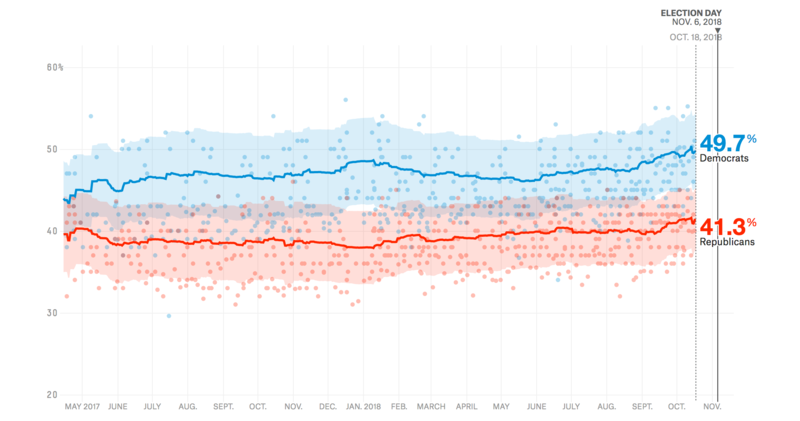 According to our generic congressional ballot poll tracker, Democrats are ahead of Republicans 49.7 percent to 41.3 percent. A week ago, our tracker gave Democrats about the same advantage (49.7 percent to 41.4 percent). A month ago, Demcrats had a slightly bigger margin over Republicans, 49.2 percent to 40.2 percent. Check out our 2018 House, Senate and governor forecasts and all the polls we’ve been collecting ahead of the midterms. A look at recent polls that asked young voters how likely they are to vote in the midterms reveals varying estimates (some high and some low). But when voters are asked directly about whether they’ll vote, they sometimes overestimate or underestimate how likely they are to vote. Hence, we’re looking at other questions researchers ask aside from whether or not someone will vote in order to measure voter engagement (which can be used as an indicator of voter turnout).